Here are some of the most popular questions we get regarding Restyle Junkie and all our services. Didn’t find the answer you were looking for? Call us at 623-580-5222 or get in touch online to see if we can help. Great news! We’ve moved our store ONLINE! We’ve collaborated with PrimeTools.com to provide & ship all your General Finishes Milk Paint, Wood Stain, Dye Stain, Glazes, & Top Coats. Now you can shop 24/7, from the comfort of your home or even get a quote! 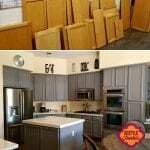 Cabinet refinishing services: We are professional cabinet refinishing experts in Phoenix who refinish cabinets with paint or stain. Distressed wood (a.k.a. barn wood): We make new wood look like distressed wood by adding texture, paint and stain. Know-how: Ready to try your hand at DIY cabinet painting and other refinishing projects? Check out our DIY video tutorials if you want to know exactly how we paint cabinets. It’s our step-by-step guide on how to refinish kitchen cabinets from start to finish (including a supply list). 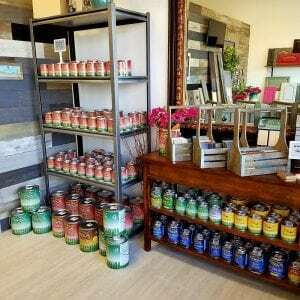 Paint & Stain: We sell General Finishes milk paint, gel stains and top coats for your own DIY products. One-of-a-kind looks: We do specialty finishes that can include repainting wood furniture and other wood items that need a makeover. This is a custom service, so please call to find out if we can help. No matter what you’re looking to do, calling us is a good start, 623.580.5222. If you have a project in mind, we can tell you if it’s something we can do for you. For quotes on professional cabinet painting, request a quote here, or check out our blog article on everything we’ll need to quote your project. What areas of Phoenix do you work in? Our cabinet refinishing service clients tend to be in the Glendale, Peoria, Anthem, Northwest Phoenix, Arrowhead, Scottsdale, Cave Creek, and now the East Valley too. Can I get a sample of the finish I want? Yes. There are a couple options on this one. Looking for something specific before committing to a project? Project samples can be created for a small fee (samples are typically included as part of contracted cabinet-refinishing services). Already hired us? Sample creation comes after a contract is signed and before work begins to ensure we’re on the same page. How smelly is everything going to be? We don’t think the products we use are overwhelmingly scented, but some people are more sensitive to smells. We make every attempt to use low-VOC products to keep scents (and environmental impact) to a minimum. Do I have to clear out my cabinets even if you’re not painting the inside? That’s totally up to you. You don’t have to remove all the contents, but there will be dust involved. It all depends on how you feel about dusting. Drawer fronts are removed with an electric screwdriver. To get that done, we need to have room in those drawers to position the screwdriver. This is always a good opportunity to do a bit of reorganizing! Because we prep our surfaces before painting, sanding is necessary and some dust will get on your items. Our cabinet painting service often includes working around loaded vanities and buffets. It really comes down to whether you’d rather unload (and reload) the cabinets or dust the contents afterward. Completely your call as long as there’s about 6 inches of clearance at the front. We do our professional cabinet refinishing at our studio. That means we load up all your kitchen or bathroom doors and drawer fronts and take them with us. Then we prep, paint, distress, glaze—whatever is part of your project—and return everything to your home. You may be amazed at our labeling abilities. Every cabinet door and drawer will be returned to its exact location in your home. Trust me, we stay out of your hair as much as possible. Well, my friend, that all depends. Each project is unique and while I share my best tips and tricks over on the blog, sometimes there’s a bit of trial and error involved. If you want the exact supplies, materials and steps I use, grab one of the DIY Videos and get my system, step by step. What’s the best way to get a quote for cabinet refinishing? We’re so glad you asked! We’ve got a handy quote request form right here on our site that you can use to send us all your details. We’ll email you back your free estimate. If that all sounds like a lot of work, no worries, we can come out to your home for an in-home consultation to gather all this info in person. Our in-home consultation fee is $125 and that cost can be applied towards the cost of your refinishing if you decide to hire us for the job. Is General Finishes really the best paint for me to use to DIY my kitchen cabinets? But of course. Oh, you were looking for more than just my professional opinion? To be fair, you aren’t the first one with that question. I’ve detailed out all the reasons why we choose General Finishes for our projects in my book, The Confident DIY Painter. Grab your free copy at www.theconfidentdiypainter.com. What is the best way for me to DIY/paint my own cabinets, furniture, wood items, etc? The folks at General Finishes have created written instructions on how to use their products that we can give to you when you come into the shop. Or, you can get that information online on General Finishes website along with numerous painting demos and other videos on their YouTube channel. However, if you’d like to know EXACTLY how Restyle Junkie paints cabinets, we’ve put together a complete video tutorial sharing all of our tips and tricks, including a supply list. You’ll get all the info you ever wanted that we just don’t have the time or space to share with you when you stop by the showroom. Do you work for General Finishes? Nope, but we sure love using and selling their products here. Rachel is a celebrity speaker at their events, but isn’t an employee of their company. If you have specific questions regarding their projects, we suggest you send them a message as they love to respond to your questions. How do I get General Finishes milk paint safely delivered to my front door? Easy. Seriously, just head over to this page and shop from the comfort of your couch. How do you sell your wood? All of our prices are by the linear foot. Let’s face it, it’s easier to calculate than board foot (and if none of that makes sense to you, don’t worry, we can help you figure out how much you need. Our price sheet has typical sizes, but if you need another length or width, let us know. We can only run softer woods through the machine to get the best result, pine or Douglas Fir. Wood must be even and less than 22″ wide. We sell the wood by the plank. Since we aren’t a carpenter shop, we do not cut custom sizes. If you can dream up the color scheme, we can pretty much make it come true. Why is new “reclaimed wood” better than real old wood (a.k.a barn wood)? Here at Restyle Junkie, we like to say that our distressed wood has all the character of 100 years without the exposure to the elements. Seriously, new wood is uninhabited, and old wood can have mold, fungus, spiders or something else calling it home. No waste. New wood doesn’t crumble like old barn wood often does. You can be assured that all the wood you purchased is usable. New wood is easy to work with. It is flat and even. Much easier to cut, build with or install using a nail gun. You can always get more. When working with real barn wood, there’s a risk that you may not have enough to finish your job. That’s never a concern when using distressed wood.